The power of electricity and natural gas. When you need the power of high pressure water jetting for projects inside your facility building, NLB has a solution. The 335 EHW Natural Gas Unit offers all the power you’ll need but without the exhaust discharge of a diesel unit. 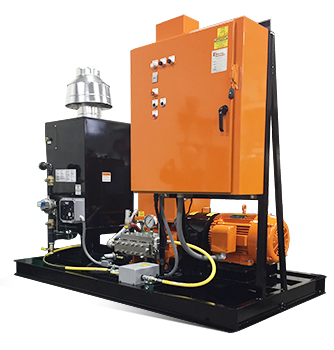 Like all of our pressure washers, the heart of the 335 EHW is a powerful and dependable triplex pump capable of 15 gpm at 3,500 psi. A stout 40 HP (29KW) motor provides ample power. Couple that with a 700,000 BTU natural gas burner and you’ve got a highly-efficient, low power use unit that will give you years of low maintenance dependability and performance. The 335 EHW is not a “me too” product in the world of hot water jetting units. This unit was designed from the ground up to exceed performance expectations of the market today with features not typically available. 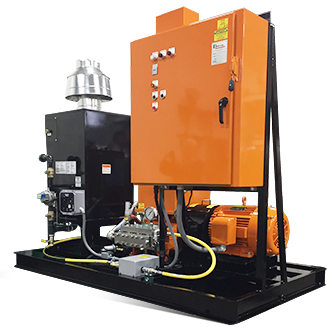 The 335 EHW has integrated water lubrication lines and a 75-micron inlet strainer that can be rinsed and cleaned, eliminating the traditional filter. A rupture disk has also been eliminated from the unit design and replaced with a self-resetting pop-off valve, saving time and money for the operator. US 3,500 psi 15 gpm 40 hp 460/3/60; 48 FLA 700,000 BTU/HR 108"L x 60" W x 79" H 4,200 lbs.